Thankful and grateful: Poo says it is a wonderful feeling to be recognised together with the other top achievers in the country as well as in the region. IT was a grand night at the McMillan Woods Global Awards gala event that was attended by the crème de la crème of the business world. Held in Kuala Lumpur, the award carried the theme: “Professionalism at the Forefront” and was hosted by McMillan Woods Global, an association of independent firms that held the event to recognise the successes of entrepreneurs in general. The inaugural awards highlighted the achievements of the global leading visionaries across all industry sectors and honoured their contributions towards the global economic development. With several award categories, many local companies and entrepreneurs earned and received their accolades that night. One award for “Emerging Woman Entrepreneur of the Year” went to Chermaine Poo, for her company, Chermaine Poo Productions. Not a stranger to the world of show business as an actress, TV host, professional emcee and events consultant, Poo is also a chartered accountant who’s been trained in the complex field of corporate finance. “Chermaine Poo Productions supports me in the production of my TV programmes, PR services, event coordination and my charity, ‘Chermaine Poo’s Cupcakes for Charity’. 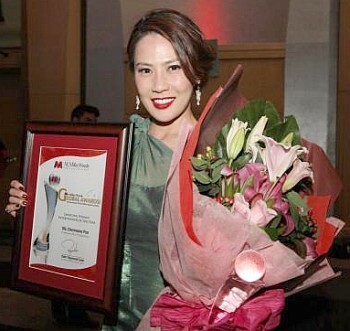 We work with our clients to assist them to re-brand their businesses, enhance their public image, venture into new market segments, form strategic alliances and advise on their corporate events,” said Poo in an interview after she received the award. The awards were not only aimed to recognise the achievements and successes but to further encourage the determination of business owners to stay competitive and to overcome challenges. In receiving the award, Poo who is also a former Miss Malaysia, was pleasantly surprised and thankful. “It is a wonderful feeling to be recognised together with the other top achievers in the country as well as in the region,” she said. Among these venerable top achievers and recipients were Hancock Prospecting chairman Georgina Hope Rinehart who was awarded as the Visionary CEO of the year and has been named by Forbes Asia & Business Review Weekly as Australia’s wealthiest person and the world richest woman, as well as Inland Revenue Board of Malaysia chief executive officer Tan Sri Dr Mohd Shukor Mahfar. According to Poo, the awards committee had carefully selected a long list of candidates for her award and she was on the list. “The candidates had to complete a lengthy questionnaire which covered every aspect of our businesses, entrepreneurial skills, leadership style, financial management, CSR, and more. Then, the short-listed candidates had to attend a few interviews with a panel of judges,” said Poo. She also set up Chermaine Poo’s Cupcakes for Charity (also known as the 3C). This is in line with her ambition to contribute to the economic, emotional and spiritual well-being of everyone she knows. “I believe that charity begins at home, and hope to use my influence to make positive changes in society. The first 3C event was held in December 2010 at Sunway Pyramid and RM18,000 worth of funds were raised for charitable organisations. The event was also aired on NTV7 on New Year’s Day in 2011. Since then, 3C has partnered with various organisations and corporations of different scales to fulfil their corporate social responsibilities,” she explained. When she has free time, Poo likes to entertain herself with motor racing, shooting and on the other end of the thrill seeking spectrum — baking. “I love these activities. I use real guns and must say that I’ a pretty sharp shooter,” she said with a grin. Back at work, Poo has also been busy with her programme, Mind Your Money with Chermaine Poo, a live TV series on business and finance that’s shown in a lifestyle magazine format. It is presented as a 20 -minute segment that is part of NTV 7’s The Breakfast Show every Thursday mornings featuring new weekly episodes to advise viewers on how to manage their personal finances, increase income or reduce expenditure. Poo, who says she is always grateful to God for her achievements, now hopes that the award will put her and her business in a better position than before. “I believe the award will be regarded as the gold standard for entrepreneurial excellence in the near future. Hopefully this recognition will enhance our corporate credentials and raise our profile as well as encourage client’s confidence,” she said. With both a strong background in corporate and entertainment businesses, Poo thinks that the two are somewhat disparate, yet similar. “Corporate is more like a science that’s governed by laws and rules whereas show business is like an art where creativity and flexibility is paramount. But both corporate and show business have the same objective which is marketability and profitability, otherwise the entity will cease to exist. I apply what I’ve learnt in the fields of accounting and finance to my show business operations. These are to have a vision and worthwhile goals while being able to manage yourself and the company from marketing to cash-flow. Also, I would incorporate creativity innovation and versatility which are the skills that I developed in show business.